All interracial dating webusites are not equal. Some have more subscribers and offer better and more features than others. Obviously, you would want to become a member of one of the better interracial dating sites. 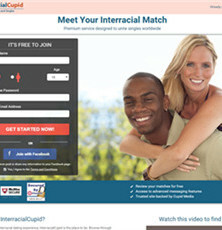 Is interracialcupid.com a great interracial dating site? Or is it just another run of the mill dating site? Read our detailed review to find out the truth. The sign-up process is quick and efficient and starts with you filling a basic form on the home page, wherein you need to provide your first name, age, and email address, besides choosing a password for your account. Alternatively, you can login using your Facebook account. Interracialcupid.com doesn’t post or share information to your Facebook page. Next, you will reach a screen where you need to list your basic details, like your ethnicity, occupation, willingness to relocate, nationality, and marital status. You can also give your profile a suitable heading and describe yourself in brief and what you are looking for in a partner. Once you are through, just click the “Browse Members Now” button. The site has three membership plans, basic membership, gold membership, and platinum membership. Basic membership is absolutely free, but you can’t do much with it. If you are serious about online dating, you might want to consider taking either a gold or platinum membership. The latter costs more, but also some great features above and over what gold members enjoy. Standard members can upload their photo, send interest to other site members, and use the “my matches” option to check out the profiles of recommended members based on their personal details and preferences. The last feature obviates the need of checking out multiple profiles to find a great match. A free member can upload up to 5 photographs. Gold members enjoy all the features that standard members enjoy, plus a few more. Additional features include, but are not limited to, initiate chat with other members and add a personality profile which allows members to tell others more about themselves. Platinum members enjoy all the features that gold members enjoy, plus a few more. For instance, they can communicate with other platinum members using video mails, something which gold members can’t do. Here are a few key features of interracialcupid.com. Through this feature you can easily cross the language barrier. It enables you to talk with members who don’t know your language. The translate feature, however, is available to only platinum members. Watch the videos of other members to know more about them and more importantly to see if they are the kind of person you are looking for. Again, this feature, too, is available to only platinum members. Video chatting takes online dating to an all together new level. This is a great feature and makes online dating so much more fun and effective. You expect a top-notch online dating site to provide you a quick and effective customer support. Interracialcupid.com doesn’t disappoint on this aspect. It provides customer support to its users round the clock, seven days a week to ensure they always receive a prompt reply to their concern. Users can contact the customer support via phone. They can also send an email to them. Alternatively, users can also contact customer support team via fax. Another positive thing about interracialcupid.com is its FAQ database, which covers most of the things about which a new user might have a doubt or two. Among other things, you will find in this section a lot of advice how to successfully date and form meaningful relationship with interracial singles. While such information is useful to everyone, it might be particularly beneficial to people who are new to interracial dating. Interracialcupid.com is certainly among the better interracial dating website, one which has all the necessary features to make interracial dating possible and pleasurable for its members. Easy to use and navigate, advanced features, and a great customer support team are some highlights of this popular interracial dating platform. All in all, interracialcupid.com is a nice interracial dating website and you are sure to benefit from joining it.